How can I import only certain layers from my DXF file into Surfer? You have the option to freeze some layers when importing a DXF file into Surfer. Objects in layers that are marked frozen will not be imported into Surfer. Click Home | New Map | Base | Base or Home | Add to Map | Layer | Base. Select the DXF file and click Open. 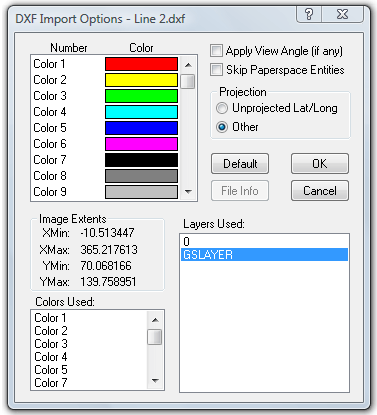 In the DXF Import Options dialog, click the File Info button. All the layers will be listed in the Layers Used section. Double click on the layer you want to freeze. 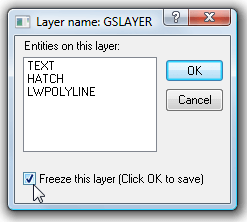 Check the Freeze this layer check box in the Layer name dialog and click OK.
Repeat steps 4 and 5 for all layers you want to freeze. Only the unfrozen layers will import.